From start to finish, buying my 2016 Hyper blue Camaro RS was great. Very knowledgeable about their vehicles, clear, upfront and will to do almost anything to make your buying experience the best ever. Would recommend. Steve was compassionate, helpful, easy to deal with and honest. Not once was I ever pressured into making a decision. Steve was also accessible and accommodating even when it was his day off. A true gentleman and the best salesman I have ever come across. The moment I arrived I felt confident I will be driving away in a brand new car. They made the process easy and quick. Dan and John are great to work with. They both worked hard and stayed in contact with me during the process. 3 days later I drove off in my brand new 2019 Yaris LE. I couldn't be more satisfied, I would recommend Toyota of Wallingford, They really put the WOW in Toyota of Wallingford. The moment I arrived I felt confident I will be driving away in a brand new car. They made the process easy and quick. Dan and John are great to work with. They both work hard and stayed in contact with me during the process. 3 days later I drove off in my brand new 2019 Yaris LE. 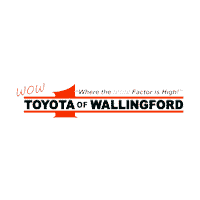 I couldn't be more satisfied, I would recommend Toyota of Wallingford, They really put the WOW in Toyota of Wallingford. I was searching for a used vehicle. Since the time I arrived everyone was very helpful. They made the process easy and quick. If I add the fact that it was Sunday. I would recommend Toyota of Wallingford. Eli and the staff were extremely helpful in our search for a vehicle. We got a great price on a beautiful truck. We'll be back for our next car! Scheduled normal service and recall fix! Upon checking needed 3 additional things and they offered to do all 3 while I was waiting!!! All items were taken care of in a timely matter! !